In the months of October and November a large number of Catalans hit the road to go picking wild mushrooms or bolets in the countryside. Although there are many edible species we use the name bolets to refer to all of them. But then there are specific names according to the type like rovellons, rossiñols, ceps, llanegas. In general they are served fried with some garlic and parsley but you can have them in stews, with meat,etc. 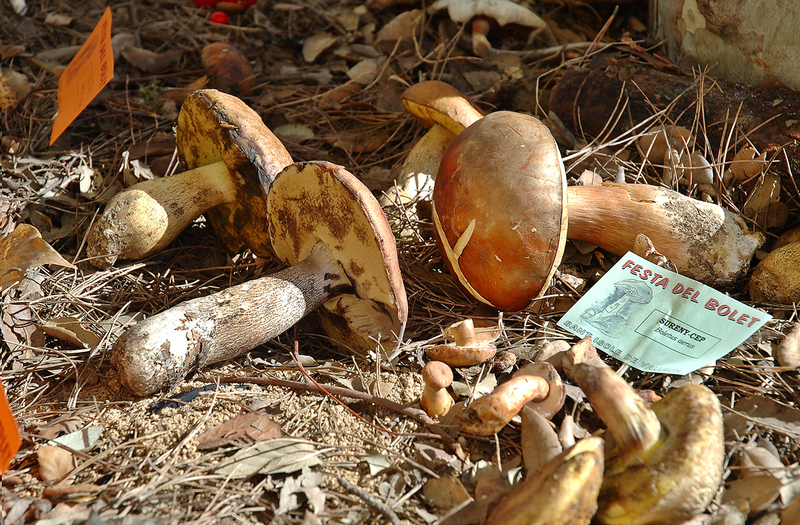 The mushrooms in the picture were part of a small sample on sale at Sant Iscle de Vallalta fair. This town is located in Maresme, a comarca or county along the coast next to Barcelones county where Barcelona City is. Once a year a market is set up to sell mushrooms and we decided to pay them a visit for the first time to try some. If you are interested, there are a bunch of similar activities in November. Check this Maresme Coast brochure in pdf to see the whole activity program.